Established in the year 2011, Indiana Creations, based in Jaipur, is one of the prominent manufacturers, suppliers, wholesalers, exporters and service providers of a wide range of supreme quality Ladies Apparels and Home Furnishing Products. Offered product range comprises of Hand Block Printed Cotton Fabrics, Dress Materials and Salwar Suits. The offered apparels are manufactured using cutting-edge machines in our ultra-modern manufacturing unit by a team of highly skilled designers and craftsmen. Available with us at highly economical market prices, these apparels are known for their skin-friendly fabrics, smooth finish, vibrant colors, alluring designs and eye-catching patterns. These apparels are available with us in diverse sizes, colors and designs, keeping the mind the diverse requirements of our valuable customers. Our company has an ultra-modern advanced infrastructural facility, which has been carefully divided into various divisions or units in the most organized manner. This division of our infrastructure facility helps us in carrying out our manufacturing, quality testing, storage and dispatching processes in a standardized and streamlined manner. Our manufacturing unit is equipped with different kinds of sophisticated weaving machines that are necessary for the purpose of enabling smooth production processes. Moreover, our manufacturing unit is upgraded as per advanced technology on a regular basis in order to meet the diverse requirements of the customers in the most efficient manner. We have appointed a team of technicians to effectively operate and maintain different machines installed in our manufacturing unit. Our company was established as a proprietorship firm under the expert guidance of our mentor, Mr. Arvind Kumar Rajoria. His vast experience and in-depth knowledge of this domain has helped us in attaining a huge clientele across the global and domestic markets. We are exporting our product in all global. Manufacturing and Trading of Chanderi Dupatta, Chanderi Kurta, Silk Saree etc. Since the inception of our company, we have a world-class infrastructural facility, which is spread over a vast area of land. Our infrastructural facility is inclusive of manufacturing, warehouse & packaging, in-house quality testing and sales & marketing unit. The infrastructure facility is well-equipped with different weaving machines, quality testing equipment and storage tools, which are required for streamlined operations. Moreover, they are upgraded as per the ultra-modern technology. In order to effectively handle our infrastructural facility, machines and equipment, we have appointed a team of skilled professionals. 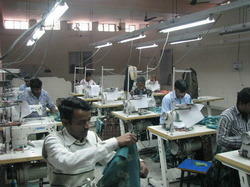 We manufacture, supply, export and wholesale an extensive range of apparels and fabric in the industry. We offer the entire product range in varied designs and textures and can be customized as per the preference at most reasonable rates. We are providing Printing job work, stitching job work services to our clients. Our product range is manufactured in compliance with the international standards of quality owing to ultra-modern manufacturing unit, which is well-equipped with different kinds of cutting-edge machines, tools and equipment. Our products can be customized as per the specifications provided by the customers. The product range offered by us is delivered within the fixed time frame at the customers’ end owing to our vast distribution network, which is well connected with different mode of transportation such as roads and railways. We offer our clients multiple payment options such as cash, online, demand drafts and invoice, keeping their budget constraints in our mind. We have been backed by a team of extremely skilled, qualified and experienced professionals since the establishment of our company. The team of professionals comprises of innovative designers, skilled & unskilled labor, logistics professionals, quality controllers, warehousing & packaging experts and sales & marketing professionals. In order to avoid any kind of hassles at the work place, our employees work in close coordination with each other. Our employees are selected through a stringent selection procedure after a thorough assessment of their skills and knowledge. Furthermore, our employees are trained through workshops in order to enhance their technical skills as per the industry laid standards.